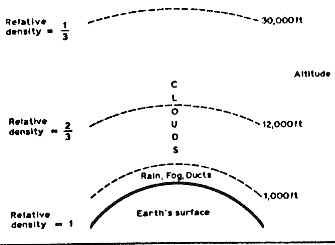 On this page you can find information on tropo propagation. A executable programm can help you calculating the possibilities of making a contact. It calculates both for a line off sight contact and for tropo scatter contacts. First some explanation what troposcatter is. 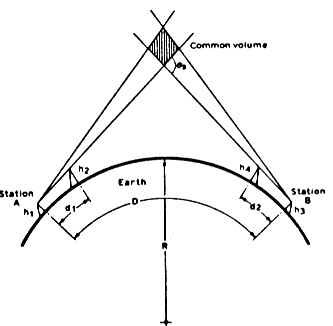 Propagation will be line-of-sight to the common volume from the transmitter. A very small fraction of the Power passing through this volume will then be scattered in all directions by the irregularities in the atmosphere. This power then propagates by line-of-sight to the receiver. The height of the bottom of this scattering volume will depend on the path length, and to some extent on the horizons of the sites, but will be typically 2000 ft on a 60-mile path, and 30,000 ft on a 300-mile path. The loss in the scattering process is usually so large that the equipment is unlikely to have enough spare capability to overcome the extra losses introduced by any additional obstructions in the path. The path loss increases by about 10 dB for every degree of horizontal angle at each station. On paths over 60 miles the increase is about 9 dB for every extra 60 miles of path length. The choice of a site with a good horizon is vitally important; it can make a difference of several hundred miles in the obtainable range. Go to the propagation calculator.